Professor Hughes conducts the Concert Choir, which are considered to be among the finest community college choirs in Northern California. 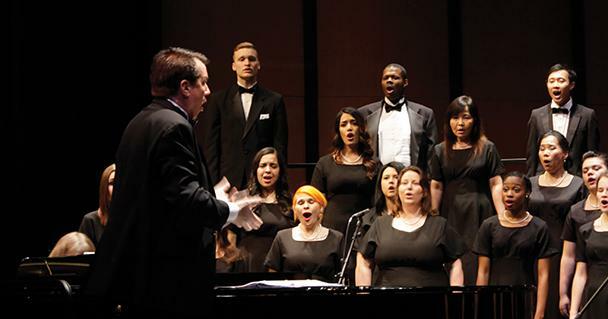 The chamber singers and concert choir of American River College held their first concert of the season, the Spring Choral Invitational, Wednesday, which also invited Folsom High School’s chamber singers and, for the first time, the John Adams Academy Virtus Chamber Choir to perform. It was the first time performing in front of a live audience for some in the ARC concert choir, but the nerves did not show as they started off the concert with four diverse songs ranging from an Israeli folk song to a piece from the blockbuster hit, “Into the Woods”. Director of Choral Activities Dr. Ralph E. Hughes, who conducted the concert choir, welcomed John Adams Academy Choir to the stage following ARC’s performance. The group from the academy was led through a series of religious, classical, and American folk songs by their conductor, Greg Blankenbehler. The choir also displayed young soloists and even a folk dance during their performance. “This was their first time? Come back, come back!” said Hughes after returning to the stage during their ovation. The Folsom High School Chamber Singers performed after, giving a performance of religious-themed songs as well as alto and tenor solos. ARC’s chamber singers ended the evening’s performances with songs themed around moonlight and nighttime. One song was arranged in sixteen different voice lines, and the singers changed formation to span the entire stage. The audience received the final song, led by tenor soloist Justin Hampe and played by an Andean band about Venezuelan men of the plains, with an ovation. Kassie Rivera, a music major who has been with the choir for five years, was impressed with the outcome of the first concert of the season. “I think all the choirs were amazing,” said Rivera. “[The] John Adams Academy choir was the best part. I was so excited to hear them,” Rivera said. “I’ve been in this choir for five years, but it’s been a great five years, especially when concerts go like this,” added Rivera. ARC’s Choral Program singers will be performing next with rest of Los Rios’ Choirs at Sacramento City College for an Intra-District Choir Concert called Collegiate Sing! on March 24 at 7:30p.m. Reservations can be made at: SCCMUSIC.EVENTBRITE.COM. Be the first to comment on "Choral Choirs performed at the Spring Invitational Concert here at American River College"